The award-winning ultra-luxury, small ship cruise line Seabourn has unveiled the names of its two new ships, both inspired by its current fleet. Announcing Seabourn Encore and Seabourn Ovation – the first will launch in late 2016 and the second in spring 2018. The line has revealed renderings and updates about Seabourn Encore via a new dedicated microsite:https://encore.seabourn.com. Filled with imagery, details and news on the ship’s progress, including “sunsets until launch,” the microsite offers an inside look at Seabourn’s stunning new ultra-luxury ship. Additional details, news and images will be revealed on the site on an ongoing basis. Expanding on the line’s popular and highly acclaimed Odyssey-class ships, Seabourn Encore and Seabourn Ovation will build on the success of the Seabourn Odyssey, Seabourn Sojourn and Seabourn Quest. This award-winning class of ships revolutionized ultra-luxury cruising with enhanced accommodations and innovative amenities when they were introduced between 2009 and 2011. Seabourn Encore and Seabourn Ovation will maintain the line’s high ratio of space per guest, enabling highly personalized service by close to one staff member for each guest on board. With the addition of the two new ships, Seabourn will have the youngest and most modern ultra-luxury fleet in the industry. Hospitality design icon Adam D. Tihany has signed on to design both Seabourn Encore and Seabourn Ovationin their entirety, drawing inspiration from the line’s rich history and yachting heritage. 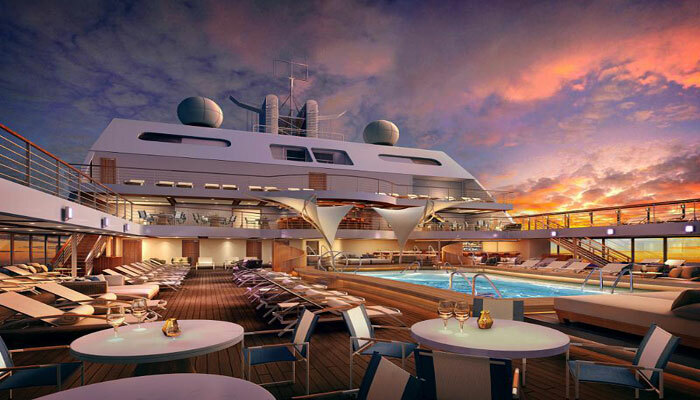 He will design all indoor and outdoor guest areas, including the multiple dining venues, The Spa at Seabourn, showrooms, casino and lounges, outdoor deck areas, and the popular Seabourn Square, the social hub of the ship with a club-like ambiance. Seabourn offers key elements that set the cruise line apart: thoughtfully appointed all-suite accommodations, most with verandas; superb dining in a choice of venues; complimentary open bars throughout the ship; complimentary fine wines poured at lunch and dinner; award-winning service and a relaxed, sociable atmosphere that makes guests feel right at home on board. The ships travel the globe throughout the year, sailing to many of the world’s most desirable destinations, including marquee cities, UNESCO World Heritage Sites and lesser-known ports and hideaways.